Racing through canyons and over hills, the Tubbs fire jumped the six lanes of Highway 101, ravaging everything in its wake. By the time of its containment 23 days later, the fire had burned 36,807 acres, devoured 4,000 homes, killed 22 people and displaced thousands of others. It was the largest and most destructive fire in the state’s history. While the cause of the fire is still under investigation, the working theory is that the high winds caused electrical distribution systems to fail and the downed power lines and transformers then sparked the fire. Our local EWB-USA professional chapter lost no time in responding. 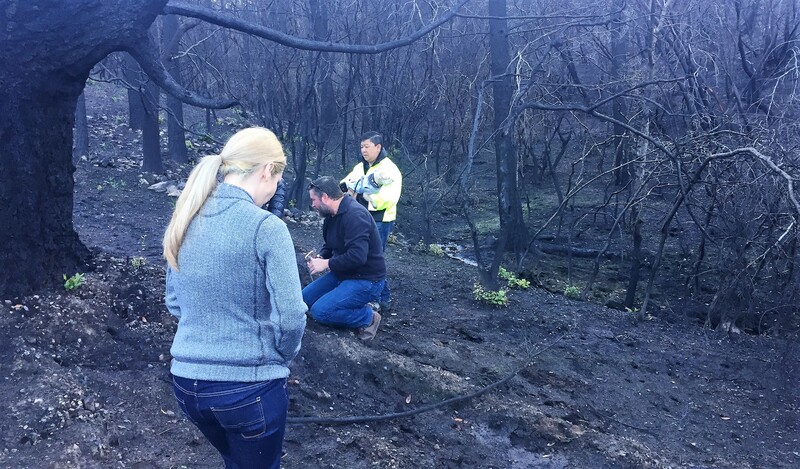 “In the first few weeks after the fire, it was really about communicating and reconnecting with our members,” said volunteer Jessica Politz. Two members lost their homes, but everyone was safe and accounted for. Knowing they possessed much-needed technical skills, the team set up a table with a banner reading “Engineers Without Borders, Ask Us a Question,” to offer up their expertise at neighborhood and county meetings. “So many people have no idea where to start when dealing with rebuilding after a fire. They bought their house, it was built, and there are a few maintenance things you need to do. But answering questions like: ‘what is a geotech study and what does a land surveyor even do?,’ is difficult for most people,” she said. This made perfect sense to Jessica who shared, “My biggest motivation for being an engineer is to help others.” Her inclination to reach out, attend meetings, connect impacted homeowners with resources and hand out her phone number — just in case someone had another question — felt right to her and the team and allowed them to be of immediate service to their community. Both of the community projects the EWB-USA team took on originated at a these neighborhood outreach meetings, where the volunteers helped community members navigate the rebuilding process and met the groups that would soon become their partners. The community of Wikiup Bridge Way was devastated by the fire. Twenty-six of the 27 homes in the community were destroyed and the fire also took out the wooden bridge, the only access point for the community. Its loss greatly hindered recovery and restoration efforts. EWB-USA took on two culvert and road stabilization projects to help residents in Wikiup Bridge Way address the loss of access to homes and erosion damage. 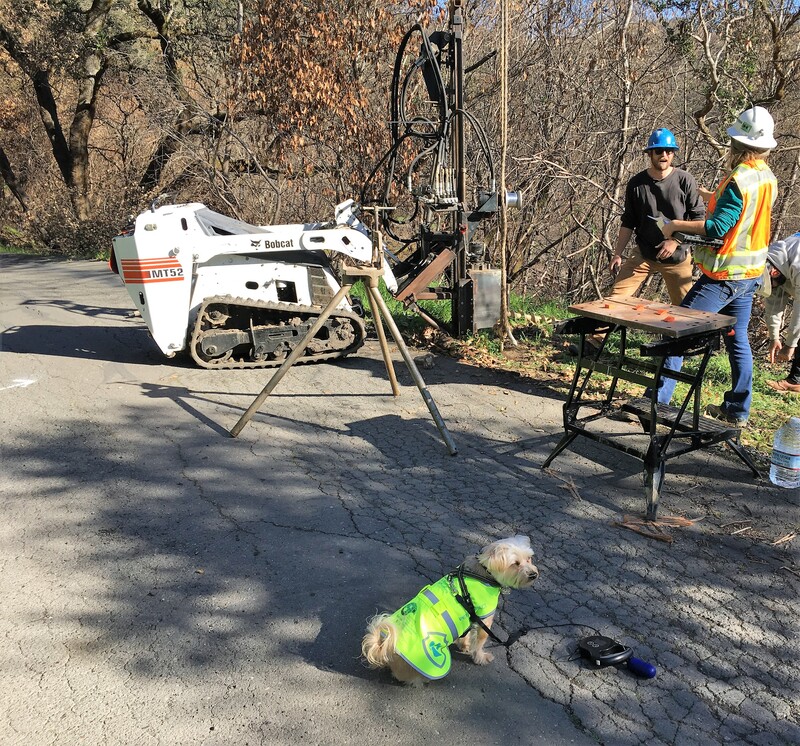 Our volunteers provided engineering, design and construction guidance for replacing seven fire-damaged culverts along the main neighborhood road and protecting the structural integrity of the roads supported by the culverts. Once implemented, the larger and improved culverts will also protect the nearby Mark West Springs Creek, downstream watersheds, and the wildlife that depend on these waters. Jessica reports that when visiting the site several months back, “everything was still black. There was zero regrowth and tons of evidence of erosion.” It had been scorched and the ground and watershed was at risk. Consider this: “When a single raindrop hits unprotected soil at a speed in excess of 35 miles an hour, it can displace soil particles five feet in any given direction,” says Rich Casale, a Certified Professional Erosion and Sediment Control Specialist for the USDA Natural Resources Conservation Service. The goal is to stop this from happening. 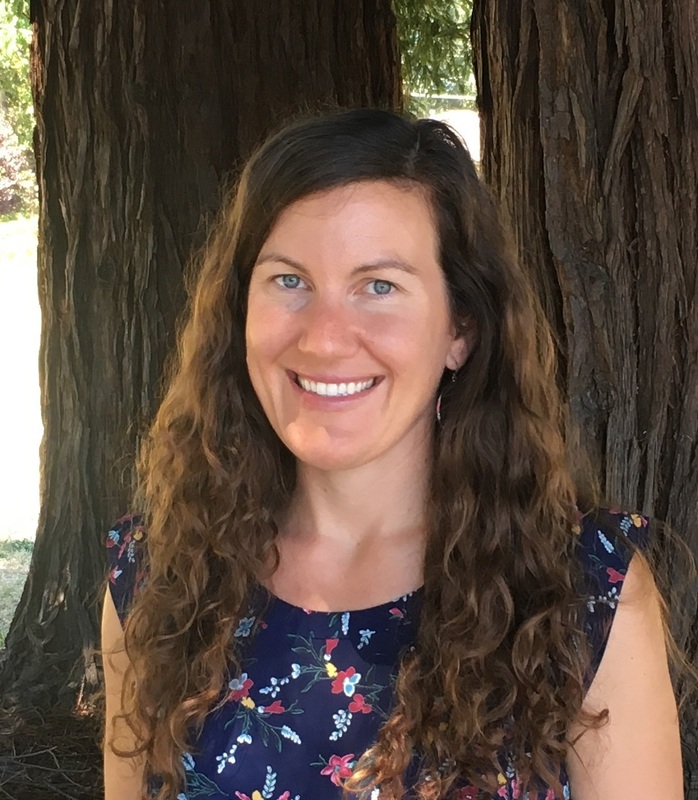 Because of the potential impact on the watershed, the project received government emergency grant funding and the EWB-USA team was able to conduct a thorough analysis of the watershed and provide erosion control recommendations. 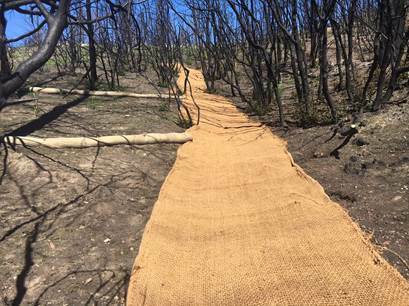 Those included identifying key locations for jute fabric and seeding, both of which were installed earlier this year with the help of Prunuske Chatham Contractors and Conservation Corps North Bay. With any natural disaster, the road to recovery is a long one, but one made easier through the support, dedication and compassion of people and organizations working on the ground. A special thanks to the members of our EWB-USA Sonoma County Professional Chapter for their tireless service. EWB-USA is pleased to have made a positive difference in helping California recover from this disaster and will continue lending our technical expertise to building resilient communities. The work in this region is far from finished. If you have the skills and interest to support continued fire recovery, consider volunteering on a project team reviewing plans for tiny houses. These structures will serve as interim living spaces for fire survivors currently residing in shelters. EWB’s Community Engineering Corps is an alliance of EWB-USA, the American Society of Civil Engineers, and the American Water Works Association that unites 200,000+ technical professionals and students to design engineering solutions for underserved communities in the U.S. The program delivers technical assistance and sustainable solutions for projects in these sectors: water, wastewater, energy, civil works, structures, agriculture and disaster response.